Item # 302749 Stash Points: 1,295 (?) This is the number of points you get in The Zumiez Stash for purchasing this item. Stash points are redeemable for exclusive rewards only available to Zumiez Stash members. To redeem your points check out the rewards catalog on thestash.zumiez.com. 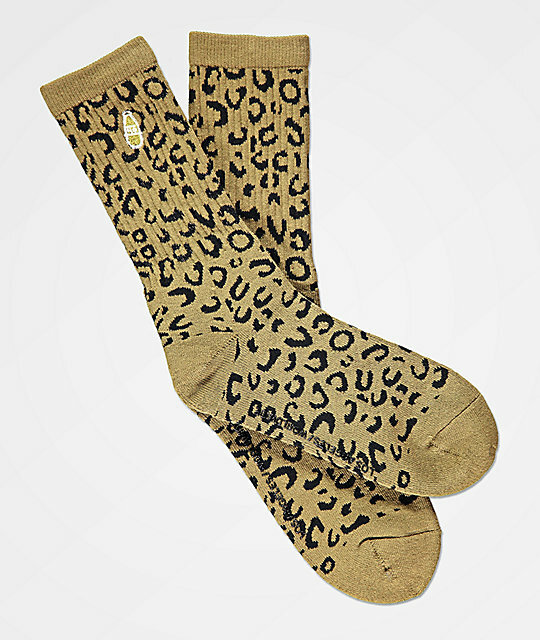 Take a walk on the wild side with the Leopard olive crew socks from 40s & Shorties. Coming with an athletic ribbed upper for a slouch-free fit, these comfortable socks feature a jacquard knit leopard print pattern throughout and are finished with 40s & Shorties logo graphics at the footbeds and upper cuffs. Leopard Olive Crew Socks from 40s & Shorties. Jacquard knit leopard pattern throughout. 40 oz. bottle logo graphic embroidered at the upper cuff. Printed 40s & Shorties logo graphic on the footbeds.